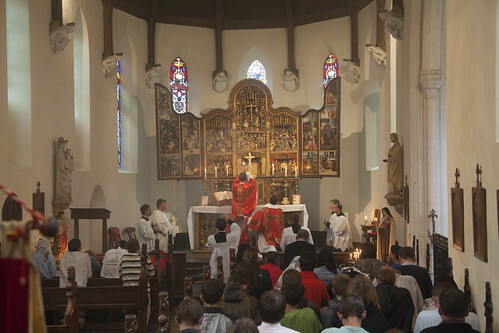 Continuing from my earlier post about the Pilgrimage, since we had four priests we had Solemn Mass each day, which was a treat; private Low Masses followed and/or preceded to give all the priests a chance to say Mass. 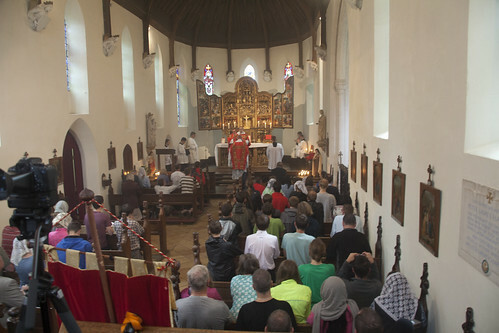 One of the high points of the pilgrimage is always Oxburgh Hall, and Mass in the private chapel of the house, which is quite substantial: you see here the transition from secret chapel in the attics to public mission church, which became the basis of the parochial system in the 20th Century. 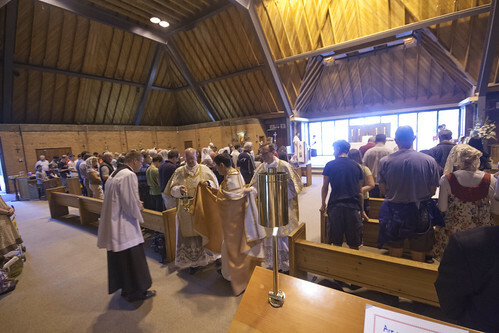 Mass at the Catholic Shrine was very well attended - more than 200 people were there, not only the walking pilgrims but others who had travelled in the LMS coach from London, or in their own cars, or who happened to be around the shrine. 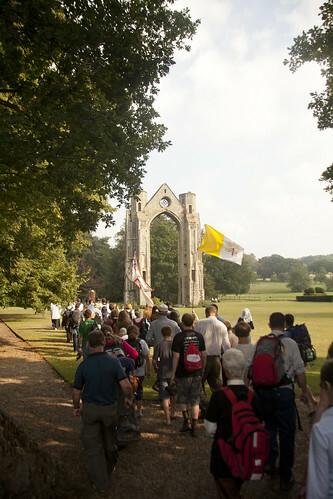 There always seem to be lots of Keralan Catholics about the place, and it is the weekend of the Youth 2000 pilgrimage. We can't fit that kind of number into the historic Slipper Chapel, where the shrine image is, so we use the 'barn', the Reconciliation Chapel. This, it must be said, is a strange structure, with even stranger, rather municipal, orange lighting. 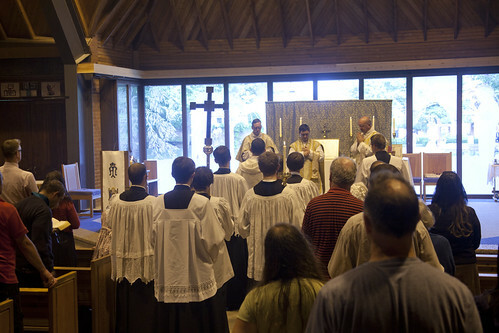 But the sanctuary doesn't impede the ceremonies of Solemn Mass, which is something. 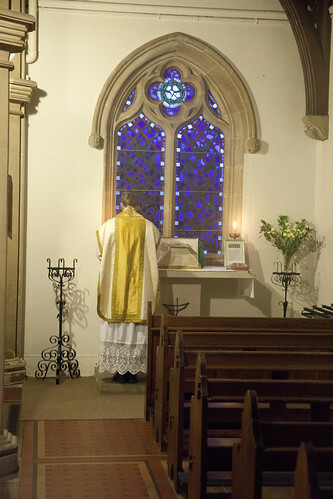 Before Mass we had the Asperges; because the priest, Fr Michael Rowe from Australia, is away from the sunlight of the window shining from behind, I could get a decent photo. 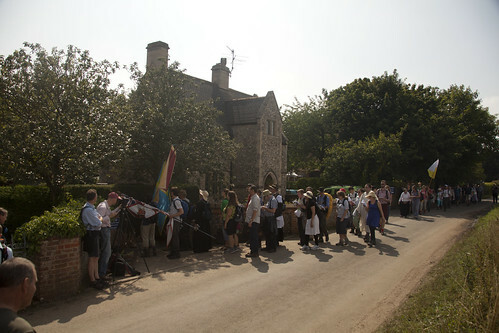 After Mass is the procession to the ancient shrine, down the 'Holy Mile' leading from the Slipper Chapel (where medieval pilgrims left their shoes) to the site of the Holy House, and the Priory which was built next to it. 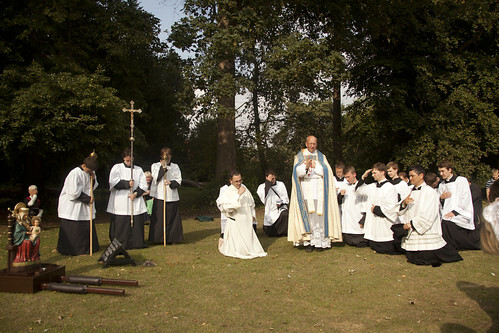 There we had our final devotions and blessing from Fr Bede Rowe. 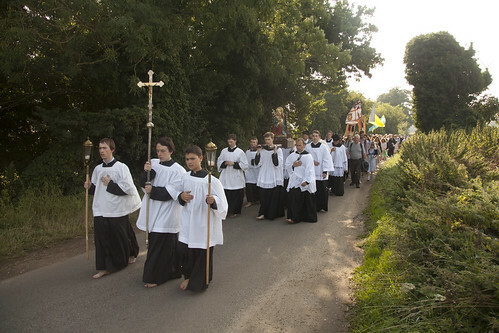 But there is a sort of postscript to the pilgrimage's devotions which I'll blog about tomorrow. Loftus on legalism: good or bad?